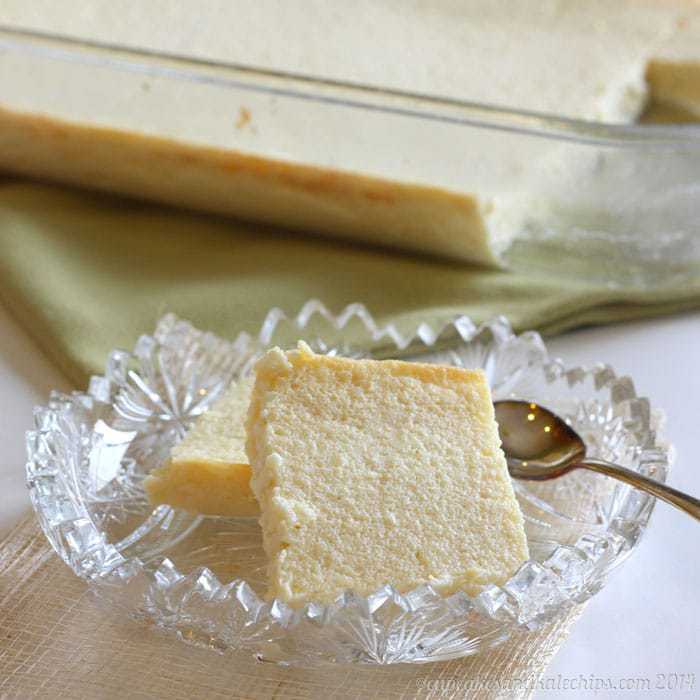 My family recipe for Syrnyk, a Ukranian sweet cheese, similar to a cheesecake, that we enjoy on Easter as a side dish or light dessert. 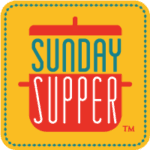 #SundaySupper is celebrating Easter and Passover with all of you today. I am sharing a family recipe that makes an appearance every Easter in my family. Sweet and creamy, and served as either a side to your ham or a light dessert, and similar to a cheesecake, we always enjoy Syrnyk – Sweet Ukrainian Easter Cheese. I’ve never been one for writing in a diary or journal. Sure, like most adolescent girls I at least made an attempt so that I would have a place to pine away and share my stories of unrequited love and teenage angst. Granted most of my angst came from being in middle school with a sister who was an annoying preschooler, but whatever. I was a geek, too busy studying and doing my homework to have a stress-ridden social life. Even now, I never really took to filling out baby books for my little guys. Honestly, I never even really liked writing until I started blogging. I’m not sure how many people actually read what I write, or if they just go straight to the photos and recipe, but it has become a place for me to chronicle some of the events, emotions, and even everyday nonsense in my life. So while I enjoy sharing these stories with anyone who cares to read, I mainly do it for me. This is my diary, only I let anyone ready it. The same thing happens with the recipes. Obviously I make things that we like to eat, but I am also thinking about things that all of you would like to eat. But sometimes I need to use the blog to record recipes for posterity. For my and my family and my children. So that we aren’t chasing around scraps of paper and texting photos of aforementioned scraps to each other. Yep, that happens. Happened with last year’s Paska, my family’s Ukranian Easter bread. Happened here. This is Syrnyk (I honestly didn’t know the name until I looked it up this week). 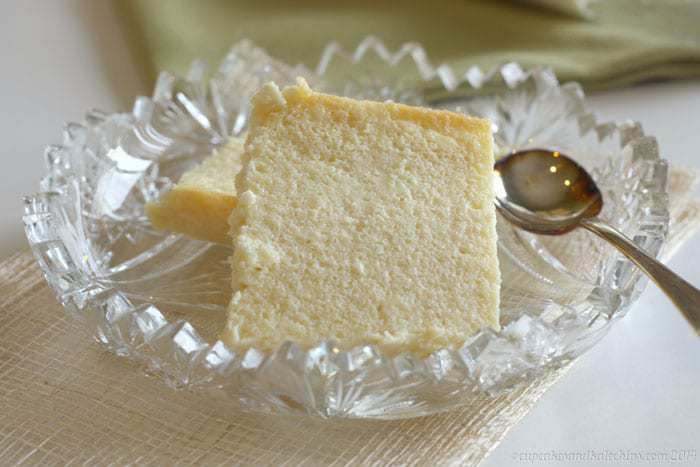 It is a sweet cheese made from cottage cheese. It likely was originally made from farmer’s cheese, like I use in my pot cheese pierogies, but I think cottage cheese is the “Americanized” version. So this is how it is made in my family, and this is the recipe I am going to share. It is quite sweet, and while often eaten as a side dish with Easter ham and kielbasa, it also make a nice light dessert. The Eastern European version of the cheese course, if you will. When we all lived here in New Jersey, while my mom was making the Paska, my Aunt Liz was making the cheeses. After she moved to Kentucky, she continued to make it, but since it doesn’t ship well, my Aunt Eugenia got the recipe from her and took on the duties. Since we are spending Easter at my mom’s this year in Delaware with neither of my aunts around, I’ve got the job. OK, I have to be honest with you – other than a couple teensy pieces that fell off as I took out a few pieces for photos then put them back in the pan, I didn’t actually try this batch before I wrote this post. I don’t know. It’s just a thing. I can’t eat it until Easter Sunday. But it looks just right, lightly browned on the edges and the little curds of cottage cheese that remain after beating the batter. And those little pieces were sweet and vanilla-y. By the time you are reading this, I’ll likely have had a piece or two, along with my family, and I can assure you that we are all enjoying it. I hope you do to. 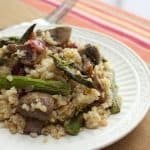 Whether you are Ukranian or not, this is a tasty recipe, and would be a unique addition to a cheese platter or dessert table. And make sure you check out the entire Sunday Supper Easter & Passover menu at the bottom of this post. How does your family save, share and pass down recipes? Preheat oven to 350°F and grease a 13 x 9 inch pan. Combine all of the ingredients in a large bowl and beat with a hand mixer on medium-high speed until light and fluffy. Pour into the pan and bake for 50-60 minutes, or until lightly browned on the edges and nearly set (it will still jiggle slightly in the center). Cool to room temperature, then chill in the refrigerator before serving. 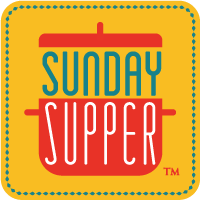 Plus #SundaySupper has all of your Easter and Passover needs covered. Make sure you save these for next year, or make them anytime, since etey are delicious any day of the year! Whole Wheat Croissants from What Smells so Good? 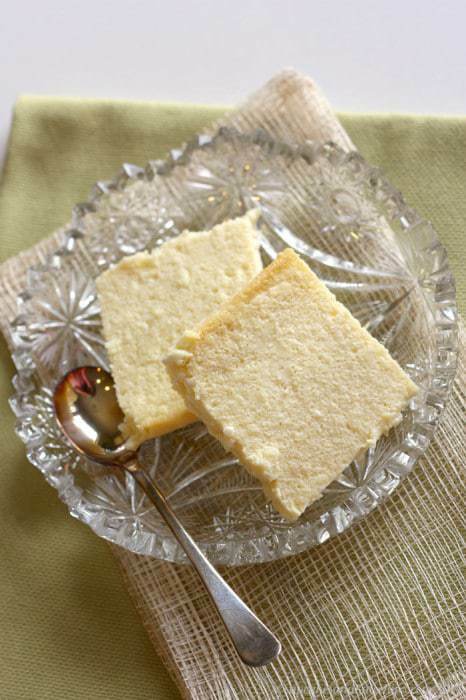 Passover Vegan Lemon Cheesecake from Killer Bunnies, Inc. The addition of lemon to the recipe sounds fantastic, Marusia! I am interested in making this for Easter this year – what kind of cottage cheese did you use? You can use pretty much any kind of cottage cheese. I’m sure my family has used every brand and everything from full fat to nonfat over the years. This recipe turned out great! My family is Russian/Ukrainian and I wanted to try this for Easter. I did a test run and and It came out tasting wonderful!!! It was not as fluffy as I thought it would be though, a little watery. I used large curd cottage cheese. Any advice on how to make it more fluffy and less watery? Ours is not watery, but not really fluffy, either. I used regular, not large curd. Not sure if that makes a difference. Besides that, really great recipe! Bit sweet for me, but yummy. Used up a batch of cottage cheese that I bought and then didn’t have a plan for- this was super easy! I added in some blackberries. Next time I’ll use less sugar! We like it thin, but I’m sure you could make it thicker as long as you bake it longer. I’ll have to try your recipe! In Poland it’s called sernik and it’s done from the farmers cheese. I need to admit I don’t really like American cakes (they are too sweet), but I definitely need to try your syrnyk 🙂 Reminds me of my home country which I left almost 2 years ago. Oh, I hope you like it, and it reminds you of home. I don’t like America cheesecake either. Beautiful, Brianne! 🙂 You’re the first other blogger I’ve ever seen with a syrnik recipe! 🙂 Mine’s Russian, so it’s understandably not quite the same but it’s got the same major stuff! I’m gonna have to try this one – I’m excited! Oh that is so cool!! Wow…this is really cool! I’ve never heard of it before, but it sounds lovely. I feel the same way about blogging–it’s such a great way to preserve family recipes. Much safer than writing them on a recipe card! I am so very intrigued by this Sweet Easter Cheese! I might just have to try this. Thank you for sharing this with us. I hope you had a great Easter! 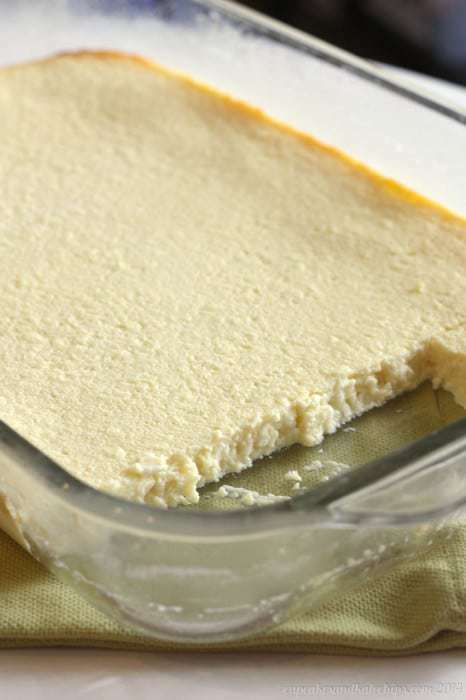 love reading about special family traditions and dishes that have been passed down. . love that you shared your family’s Ukranian Easter cheese recipe! Happy Easter! What a delicious and wonderful tradition! I can’t wait to try out your recipe! WOW! This looks fantastic. I can’t wait to try it. Love recipes with strong ties to tradition. This is very interesting, looks like a sweet and light cheese recipe. I agree it is nice when people actually read the whole blog post and understand what you are really talking about. Happy Easter! I’ve never thought of a blog as an online journal, but you’re right that’s what it is! I suppose in that respect, being a food blogger has it all over being a wine blogger because you’re sharing recipes…And thanks for sharing this one! It looks great! Kiebasa is big around here at Easter. This cheese sounds perfect for satisfying my sweet tooth! Thanks for sharing it, Brianne! Yum! My background is Ukrainian, but it’s two generations back so I don’t know much about it..or anything about the food at all. I’ll have to try this! What a cool recipe, love it for Easter, thanks for sharing!! That looks rich and delicious, Brianne, and I love the story that goes along with your sweet cheese. The stories are my favorite part of reading blogs. Thank you for sharing! I’ve never heard of this, but now I want it on my table today! I like that it is so easy, too, with just a couple of ingredients. Perfect. This looks so good and so easy!. I can not wait to try this! Happy Easter! It is so nice to have a place to chronicle favorite family recipes! I’d love to give this a try! Wow, I have never seen a recipe like this! It’s light, healthy and looks so moist! I have to give this one a try! It’s is really good. I actually want to try decreasing the sugar sometime, but forms traditional dish on Easter, I didn’t want to mess with it the first time I made it. There are so many wonderful Easter dishes that I’ve never seen before! Your syrnyk looks marvelous! Happy Easter! Easter is one of the few times of year we have these traditional dishes. Happy Easter to you and your family! Ohhh yummmm. I am bookmarking this. 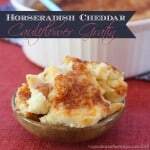 I am a HUGE fan of anything with cheese and this looks so light and creamy! Thanks for sharing your family’s recipe! It is simple and tasty! Very interesting Brianne. Since Syrnk has cottage cheese doesn’t that cancel out the sugar and just make it a good for you dessert? Seriously , thank you for sharing this beautiful tradition. BTW What a great attitude you have about sharing your writing…It is always best to do it for ourselves…But it is always nice when people do actually read what we’ve written. Thanks Kim. I think it totally makes it healthy. We’ll ignore the cup of sugar. I am so happy to share my stories.